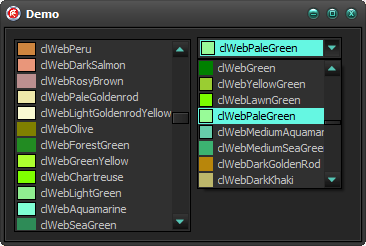 I just commit in the Vcl Styles Project two new fixes to patch the QC 114040 and QC 114032 (these issues exist in Delphi XE2 and XE3), both reports are related to the Highlight colors used to draw the TColorBox and TComboBoxEx components when the Vcl Styles are active. 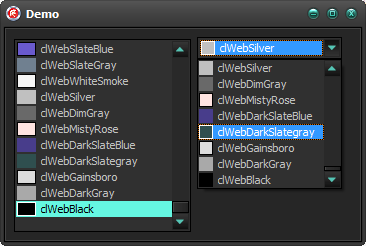 As you can see in the below image the TColorBox component doesn’t use the proper highlight color, but the TColorListBox uses the highlight color of the current Vcl Style. The TComboBoxEx control have a similar issue. 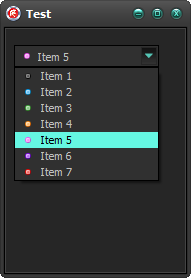 In this case fixing the Style Hook related to the TComboBoxEx control was the key. To apply this fix, just register the TComboBoxExStyleHookFix style hook located in the Vcl.Styles.Fixes unit. Alexey Sharagin from Embarcadero just wrote a blog article titled Tuning VCL Styles for Forms and Controls, which shows some features related to the VCL Styles introduced in Delphi XE3. Categories: Delphi, Delphi XE3, VCL Styles | Tags: Delphi, Vcl Styles | Permalink. 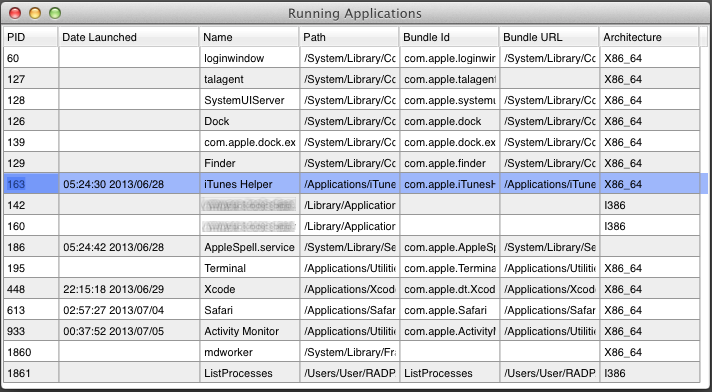 Delphi XE3 includes support for sensors in OSX and Windows, the classes and types necessaries to access such devices are defined as abstract classes in the System.Sensors unit and implemented in the System.Mac.Sensors unit for OSX and System.Win.Sensors unit for Windows. This article will focus in the Windows side implementation. Windows 7 introduces the Sensor and Location API, which unifies the access to hardware devices like GPS, Light Sensors, Biometric Sensors and so on. Avoiding the need of use a specific dlls or SDK to control the sensor devices. this API is condensed on these files which are part of the Windows 7 Software Development Kit (SDK). Sensorsapi.h The main header file for the Sensor API. This header file contains the interface definitions. Sensors.h The header file that contains definitions of platform-defined constants. FunctionDiscoveryKeys.h The header file that defines device ID property keys that are required when you connect to logical sensors. Sensorsapi.lib A static library that contains GUID definitions for the Sensor API. PortableDeviceGuids.lib A static library that contains GUID definitions for Windows Portable Devices objects. All these headers was translated by Embarcadero and included as part of the RTL of the Delphi XE3, these are the units which contains such translations Winapi.Portabledevicetypes, Winapi.Sensors, Winapi.Sensorsapi, Winapi.Locationapi. Fortunately an additional set of classes was added to wrap the sensors API, these classes are defined and implemented in the System.Sensors and System.Win.Sensors units. So you don’t need access directly interfaces like ISensor or ISensorManager to gain access to the sensors. In order to gain access to the sensors you must get an instance to the TSensorManager class and then call the Activate method, from here you can iterate over the Sensors property or use the GetSensorsByCategory method to get an array of TSensor objects filtered by an TSensorCategory. 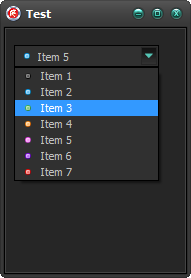 Now depending of the sensor category, you must cast the TCustomSensor to the proper specific class, in this case we will use the TCustomLocationSensor class. Not all the properties exposed by the Windows sensors and Location API are mapped directly in the TCustomSensors class, so to access this additional data you can use the HasCustomData and CustomData indexed properties and use one of the values defined in the Winapi.Sensors unit which is the translation of the Sensors.h header file. Check this sample console application which enumerates all the sensors and properties. If you don’t have sensors in your machine you can play with these virtual sensors. Categories: Delphi, Delphi XE3 | Tags: Delphi, winapi | Permalink.